ParaNews.net » Blog Archive » What Is The Best Online Backup for Mac? While other services are truly unlimited with their storage options, IDrive® doesn’t have that same freedom. But that’s okay as it makes up for it in other ways. The security on the IDrive® is pretty tight. It uses a 256-bit encryption before your files leave your Mac. While they are on their way to the cloud they stay encrypted. During transport IDrive® uses a 128-bit secure transfer connection which is the industry standard. While your files and data are sitting in storage they remain encrypted and you have full control over your encryption key. Your online account is password protected which is also really nice. One of the best features that IDrive® has and I wish other services would provide is remote wipe. This means if anything happens, your computer is stolen for example, you are able to erase your files from your Mac itself! This is pretty great because we all know Macs are expensive and unfortunately can be a target for thieves. While we’re on the topic of wiping your Mac remotely, that’s figure out how that all works. IDrive® has mobile apps for not only your Apple products but also for any Android and Windows Phone devices you might have. Lots of people have a PC and an iPhone as well there are many people with a Mac and an Android tablet. The app is also pretty cool because it gives you access to your backups which allows you to share and edit your files when you aren’t on a computer. Since hand-held devices are becoming faster and stronger this is a really great option to have. The app itself will also allow you to back up your device and allows you to save video, photo, contacts, text messages, music, and calendar events. When you’re using any piece of technology for the first time there is bound to be a learning curve. One of the benefits of IDrive® is the effort they put in to making the learning curve as easy as possible. The website is filled with such wonders as video tutorials and extensive FAQs pages. There are dozens of answers and step-by-step instruction. As well, if you feel like you want to talk to a real person you can contact customer support via telephone, live chat or you can even send them an e-mail. Mac users often find themselves in a strange situation. They’ve got top of the line equipment but that doesn’t mean they can use any technology around. Not all technologies are made equal and IDrive® understands that. It has created its programming with the special considerations Mac users have come to know and expect. It’s a perfect companion to any Mac computer and allows you to still have access if your smartphone is of a different system so you don’t have to feel like you are restricted to Apple products. The online backup is an awesome service that you can really sink your teeth into and not be afraid of it biting back. 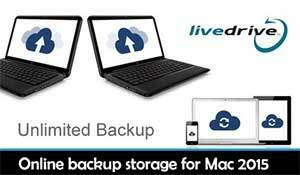 Check out Mac-oriented online cloud backup services here.